Cozily appointed, the Das Tree Haus offers you the opportunity to experience breathtaking views from your own private treehouse. 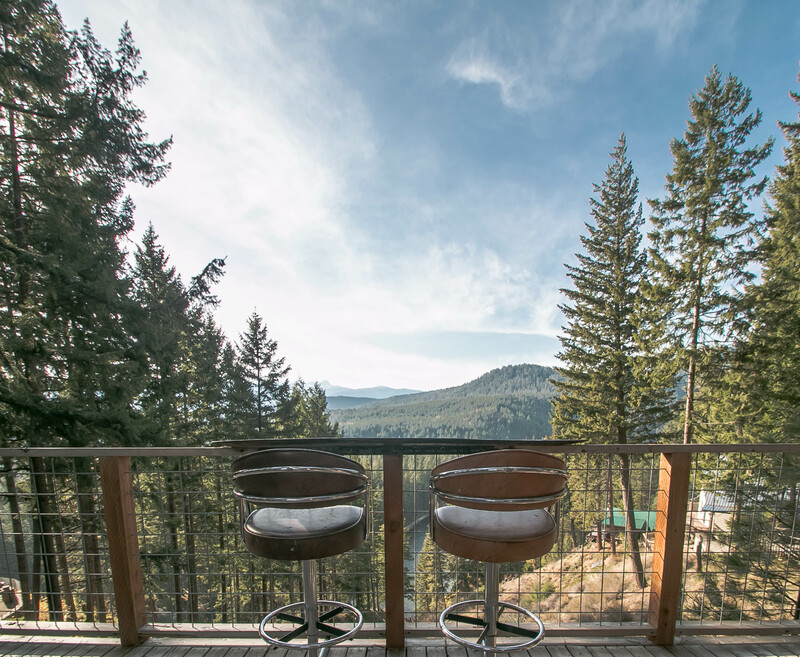 This bungalow style getaway is truly unique in its features with its treetop views of the Wenatchee River and Icicle Ridge while cradled in towering ponderosa pines. Pulling up to the Das Tree Haus, you will find a privately fenced drive thru parking with plenty of space to unload your bags and stretch your legs. Through a gate, you will enter onto the covered porch to the front slider. 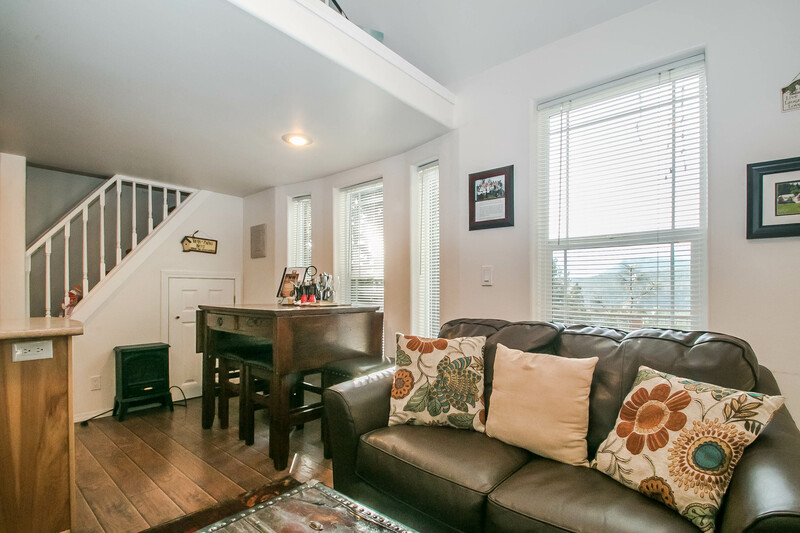 Into the living area, you will find a cozy set up for two with leather love seats and a flat screen TV. Bring your romantic comedies or horror films for an evening of snuggling up together. 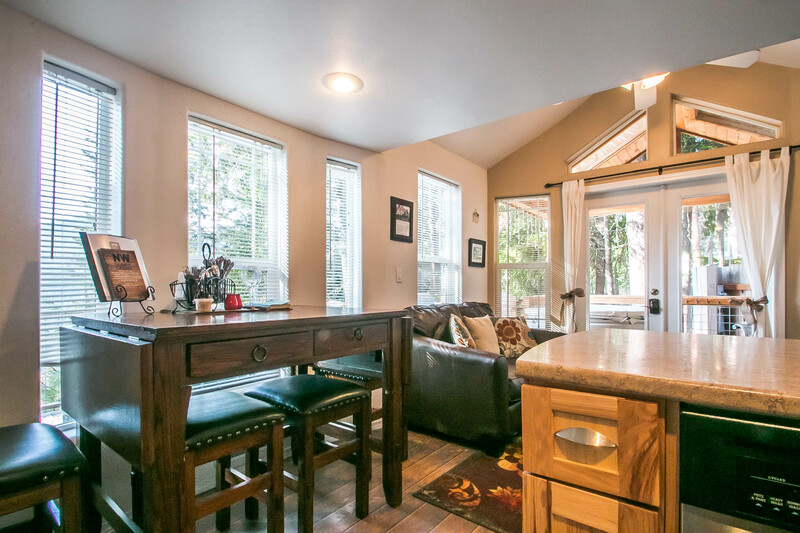 Off the kitchen is the dining nook with a bar height table situated just under picture windows that provide the perfect morning view of the mountains to go with your coffee. 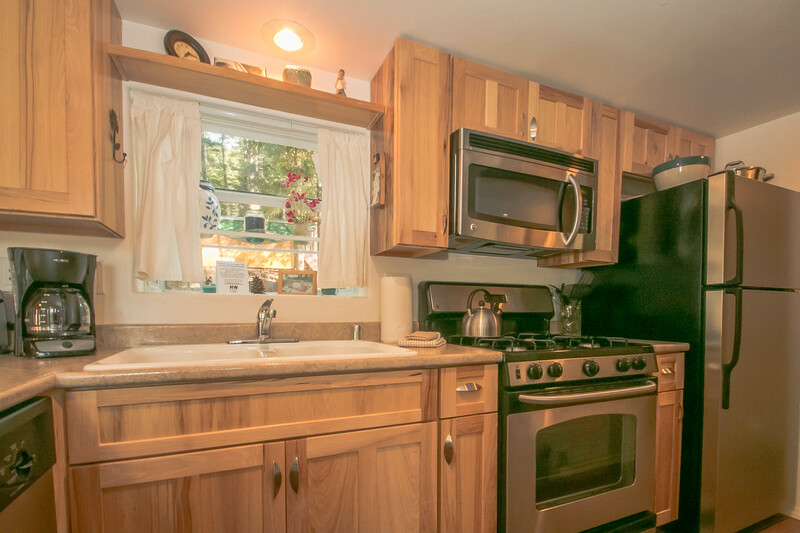 A galley kitchen comes equipped with anything you may need to whip up a gourmet meal from 4 range gas stove, microwave oven, full sized refrigerator, double sinks dishwasher. 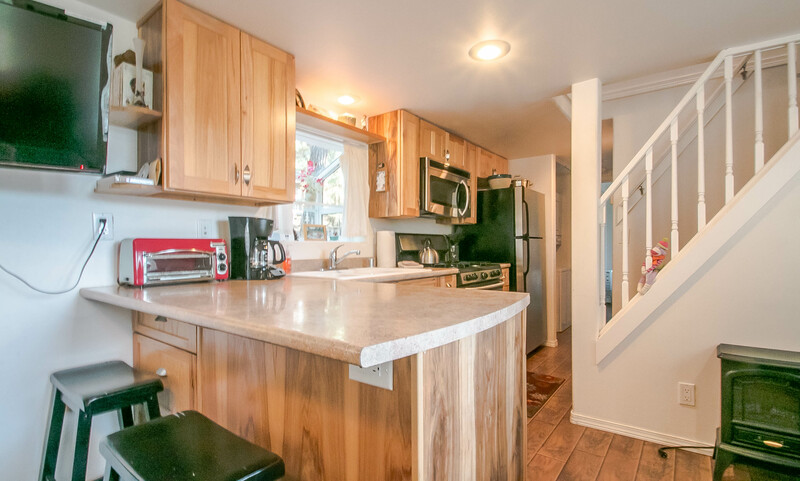 Through the kitchen, you will have a full sized bathroom with a shower/tub combo, plenty of counter space and an exterior door for porch access. Laundry? 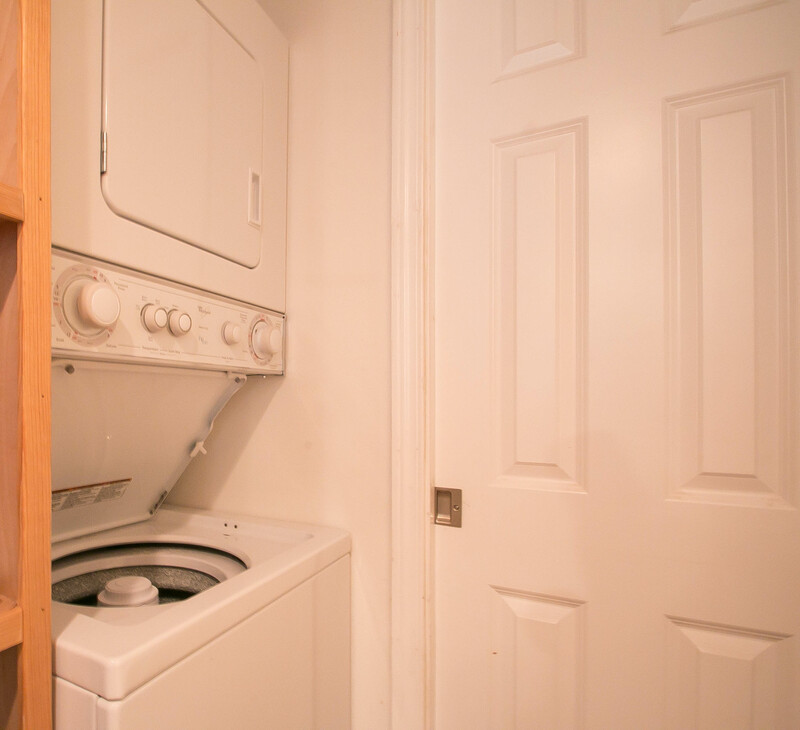 No problem, the hallway closet houses brand new stackable washer and dryer for any clothing needs. After a long day of hiking or skiing, nothing feels better than crawling into the comfortable queen sized bed for a good night's sleep. 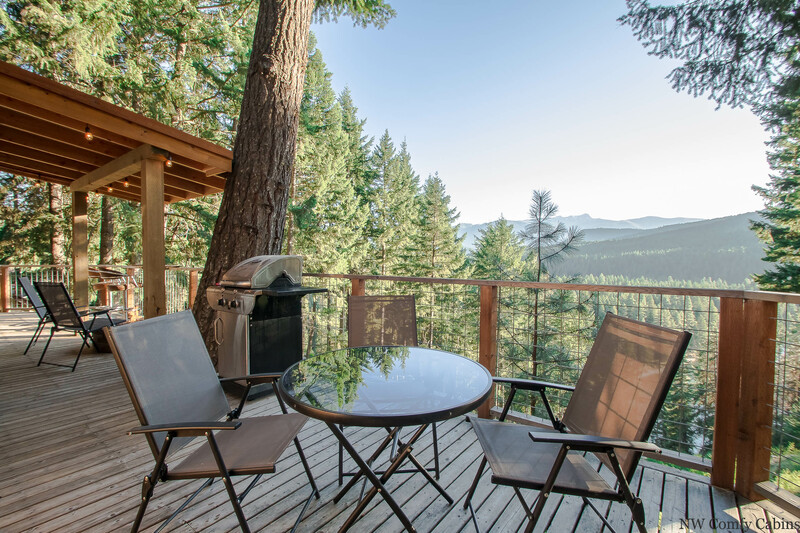 The wrap around deck with breathtaking views of the river and mountains from all angles is a great place to grill some burgers and enjoy them over a sunset. If the night is clear you won't have any problems stargazing around the propane firepit keeping your toes warm. A quick dip in the hot tub for two is great for weary muscles or some deep conversations. The Das Tree Haus is perfect for you and your special someone to reconnect, relax and reminisce. This home is located on a cliffside. The views are beautiful but it is not safe for children. The deck is fully fenced to help keep pets contained. 4WD, AWD or chains required for winter access. The road conditions can be unpredictable. PLEASE NOTE: this is a privately owned vacation home and we recognize that the home may sleep more than 2 people. 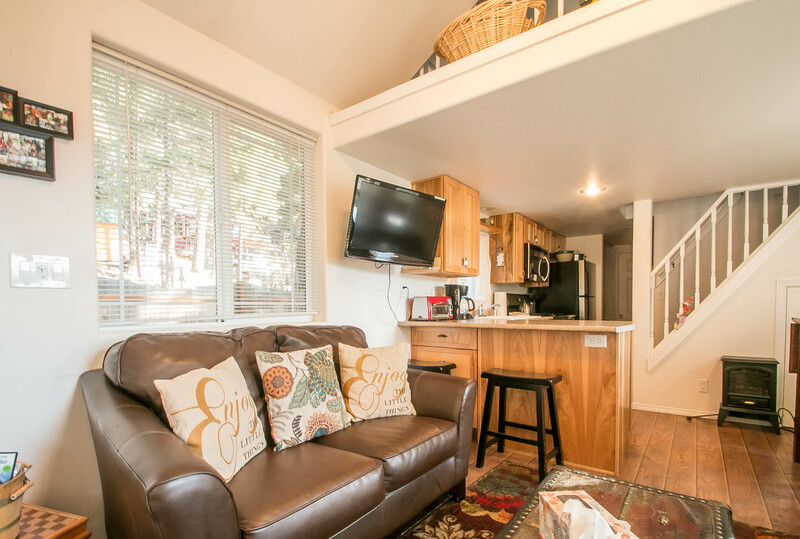 The owners (based on fire marshal regulations, Chelan County rental regulations and out of respect to the communities we live and work in) allow a maximum of 2 guests under the rental contract. There are never to be more than 2 guests staying at the property during any rental contracted period of time. If more than the contracted number of guests are found on the property the contract will be null and void and guests will be required to vacate with no refund. Please understand and note that we are legally bound to adhere to our contracts with out owners and regulations. We respect and appreciate the efforts that allow us to offer vacation rentals for all to enjoy. The Das Tree Haus was a a great place for our romantic weekend getaway! The house if around 16 miles from Leavenworth so the commute wasn't to lengthy. The property is cozy - perfect for a couple and even for a child or two. The location was very clean both inside the house and around the property. Most basic cooking/eating utensils were available except we were not able to find tongs for the BBQ or a wine bottle opener. The house had plenty of seating downstairs and a futon, pillows and bean bag chairs in the small loft upstairs. The loft looks to be meant for younger children however my partner and I ended up in the loft each evening watching VHS movies from the wide selection provided. It was a bit nostalgic! The bed in the master bedroom was a little disappointing as it seems to be at the point of replacing. My partner and I had to sleep with out knees pointed towards the center so that we did not roll into each other. We really enjoyed the hot tub which was a good size for 2 adults. It was clean and ready for us when we arrived along with fresh towels. The view from the porch is AMAZING!! We watched a gorgeous sunrise 1 morning when it was clear enough and even had snow on the last day of our stay. Manager response on 2019-04-15 - Response from NW Comfy Cabins Inc. Thank you for your input. The bed is brand new so I will send someone over right away to check the center supports. Very sorry that happened and we hope that you will come back another time to enjoy the Das Tree Haus. The cabin was very clean & well-decorated. It is a little on the snug side but absolutely perfect for a couple or a small family (w/ younger kids not older ones). The view from the deck is lovely and the BBQ & fireplace area is comfortable and well-kept. The cabin has convenient amenities (washer/dryer, dishwasher, microwave, coffee maker, Keurig, & TV) but there isn't much in the way of food/provisions kept in stock. Overall our stay was very pleasant & I would stay there again! Manager response on 2019-04-03 - Response from NW Comfy Cabins Inc. Thank you for your comments. We really do not allow more than 2 guests at this is specifically set up for a couple retreat as that is the most comfortable way to enjoy this adorable space. 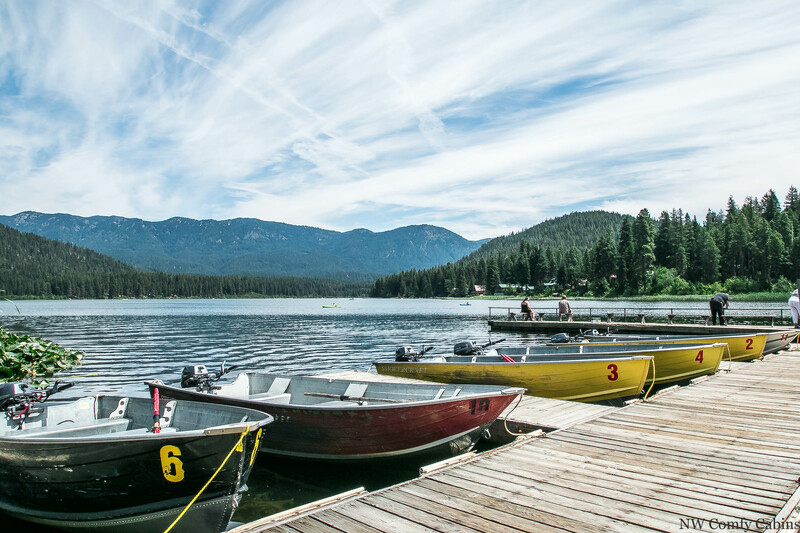 Food items are not left at the cabins as we cannot assure the quality and safety of any open items. Coffee and creamers are the only edible things that we leave (and an occasional surprise treat ;0 We hope you will be our guests again one day. Thank you for your comments. 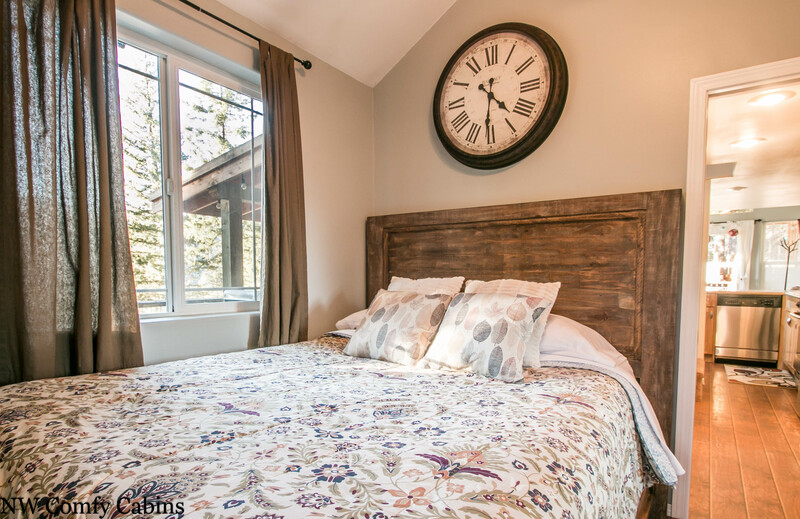 We really do not allow more than 2 guests at this cabin, it is specifically set up for a couple retreat as that is the most comfortable way to enjoy this adorable space. Food items are not left at the cabins as we cannot assure the quality and safety of any open items. Coffee and creamers are the only edible things that we leave (and an occasional surprise treat ;0 We hope you will be our guests again one day. 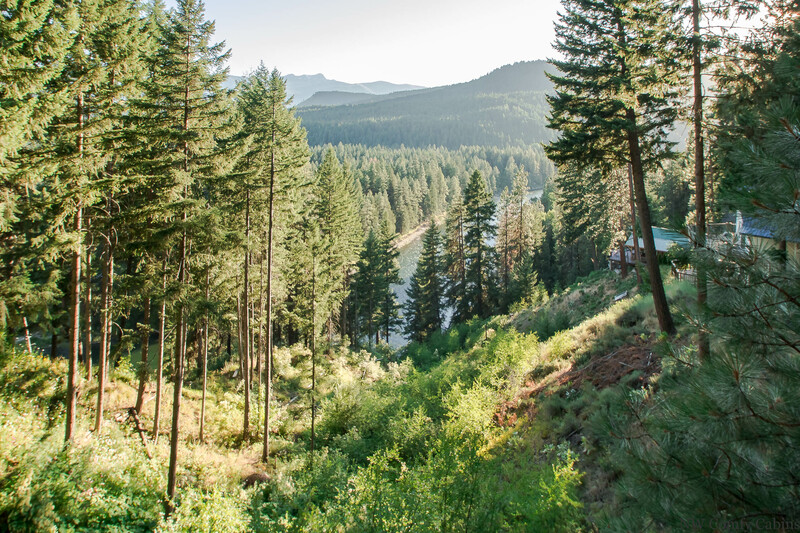 This cabin was beautifully situated with views of the mountains and the river. It was very clean and cozy - very comfortable for the two of us. We enjoyed relaxing in the hot tub on the deck while taking in the views. It was very quiet and we even heard eagles in the background. We had some trouble lighting the fireplace on the deck but we called for help and they came out and fixed it right away. The owners were very helpful and responsive. We loved staying here and would highly recommend it! Manager response on 2019-03-27 - Response from NW Comfy Cabins Inc. Thank you for your comments, and thank you for your patience so that the fireplace could be fixed in time for you to enjoy it. It is so disappointing when an appliance or item 'fails' but we are grateful that it was able to be fixed quickly and that you could enjoy the incredible views and outdoors while sitting around the fire. That never ceases to be a wonderful way to spend an evening, especially with a loved one. We hope to have you back again and we appreciate you taking the time to share your experience. My boyfriend booked Das Tree Haus for a special getaway. It was beyond perfect. It was exactly as described if not better. The views are amazing and the property was well maintained. It was about a 20 minute trip to Leavenworth but so well worth the drive. There is a cute little loft upstairs with a TV and a ton of kid friendly movies, so would also be appropriate to bring a child. There isn't a lot of space, so definitely not for a family. Great that your furry kids are welcome too!! They definitely went above and beyond. There was a dozen gorgeous roses with champagne waiting. I do not believe this comes with the rental, but my sweet guy made it happen. So, if you have any special requests, definitely ask! Also in the directions it said the navigation would not take us there, but we used WAZE and it worked. Pay close attention, it is easily missed. They give you VERY GOOD directions and the AP isn't needed, but something to make a note of if you depend on technology like we do. Manager response on 2019-01-15 - Response from NW Comfy Cabins Inc. Thank you so very much for your comments. It was our pleasure to accommodate your special needs and make your stay a bit more special. We do not generally allow children at his property but if requested we can consider special arrangements in that regard, as you said the loft is a lot of fun for kids and the family that owns this cabin does have children. We hope that you will come back again. This was an amazing find. So cozy, with everything you could need aside from your own food. The place was spotless, the customer service unparalleled and charming does not begin to describe the cabin. It was simply put perfect. The views and surroundings were breath taking. I honestly wouldn’t change a thjng except to make my stay longer!! We will be back for sure and more importantly it will forever remain one of our favorite memories. Manager response on 2019-02-27 - Response from NW Comfy Cabins Inc.
Lisa, to say you just made my night is putting it mildly. It is thrilling to hear things like this and makes all the hard work worth it. We are so happy that your time was memorable and that you enjoyed the cabin so much. Please remember that you will always have your return guest discount waiting for you and we are happy to provide it to you. Thank you for your comments and "welcome back' any time. Das Tree Haus is a great, quiet cozy cabin with a fantastic deck and view. The cabin was very clean and well-appointed for all the comforts of home. We enjoyed the hot tub and grilling on the deck. That is great to hear. This is one of the most relaxing places and couples really enjoy the time they spend at the Das Tree Haus. It is a bit magical for sure. Thank you for sharing. Doggone Bee's!! I am so sorry to hear about the bees invading your time. They are rather unpredictable and we had such a light year of bees this year, but you never know where they will show up. I wish that we had known while you were here so we could set up traps and even smoke sticks like incense, works really well and we can always do that kind of thing to keep them at bay. We do have our phone numbers posted on the website, mobile app and at the cabin so we do monitor our phones and text at all times to be able to react when needed for this kind of thing. I hope you will come back again soon despite the bees, they really don't last long but they can be annoying when they show up. Our apologies to you both. Beautiful location, wonderful cabin! The patio, fire pit and hot tub were all great amenities. We will definitely stay with NW Comfy Cabins again! Everything was exactly as we hoped. 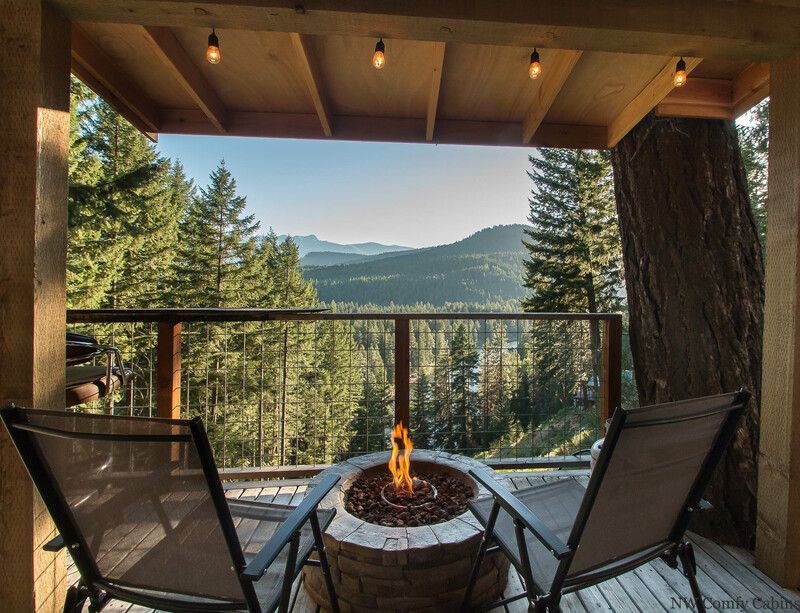 Private, cozy and all the necessities perched atop a hillside with a view of the Wenatchee River and miles of forest. Very happy that you enjoyed your time and the Das Tree haus. The views are rather hard to explain, they are simply incredible. Thank you for being our guest and we hope to have you back again. Nice little place. It was a perfect weekend getaway for two. Manager response on 2018-11-12 - Response from NW Comfy Cabins Inc.
We are so happy to hear that you had a wonderful stay. We look forward to having you stay with us again! This cabin offered a beautiful mountain & river view, quite neighbors and a compact living space. We look forward to having you stay with us again! One of the most beautiful stays I’ve ever experienced. Manager response on 2018-10-28 - Response from NW Comfy Cabins Inc.
We are so happy to hear that you had a wonderful stay. It is really a remarkable little getaway and the views are hard to ignore. I think that the covered outdoor area with the fire make for a special evening opportunity to sit and share moments that might be rare otherwise. We hope to have you back one day. The cabin was adorable with fabulous views of the river and mountains. Unfortunately the owners sent so many emails and phone calls prior, during and after the stay that it inhibited the relaxation of our trip and felt intrusive. I would not stay here again because of this. We also found hair in the towels, shower and the sheets of the bed yet were expected to clean a significant amount of the cabin ourselves prior to leaving. Manager response on 2018-10-21 - Response from NW Comfy Cabins Inc. Manager response on 2017-12-04 - Response from NW Comfy Cabins Inc.
Love to hear it! So happy that you enjoyed a peaceful and relaxing visit in the mountains. Manager response on 2018-01-03 - Response from NW Comfy Cabins Inc. The river and mountains are much closer than they look in the photos, beautiful view! If you want more than 1 cup of coffee at a time, bring a french press or coffee maker. Small but very cozy and quiet, had a great time. Manager response on 2017-10-15 - Response from NW Comfy Cabins Inc.
My husband & I came here for a winter getaway the week before Christmas. It was perfect! The cabin was clean, cozy, and comfortable with breathtaking views. 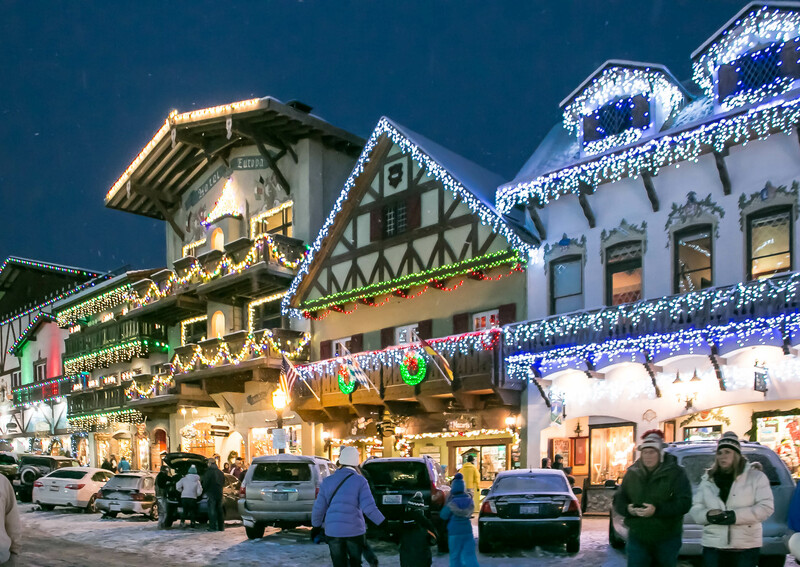 We went into Leavenworth and enjoyed all the lights, shops, and restaurants. We also took a horse drawn sleigh ride in the snow at near by Eagle Creek Ranch. We had an amazing stay and can't wait to come back. My only recommendation would be is to replace the mattress as it does dip in the middle. Overall I give this cabin 5 stars and would recommend it to anyone who is looking to get away and unplug. Thank you for a wonderful stay! Manager response on 2017-12-25 - Response from NW Comfy Cabins Inc. The hot tub was not functioning well on the third night. Manager response on 2018-01-31 - Response from NW Comfy Cabins Inc.
Expectations were high and this place was better than expected! Very clean and felt comfortable right away. Wish we had stayed longer! We will definitely be returning! We were delighted with the condition of the home, the little details that were attended to and the cozy quality of the space. The home was beautiful and had a marvelous view. It was very clean and comfortable. Hot tub and propane fire were a real bonus for a wintery week in the mountains. We will look for properties with NW Comfy Cabins again! This place was excellent. I was surprised by number of items on hand in the kitchen. The views were exceptional. We will consider staying here again. This place is wonderful. Loved everything about it. One thing that was a little bit of a bummer was the proximity of other homes--it looks a lot more remote in the photographs than it is; there are two homes right next door so we kept our blinds down for part of the trip. The view from the deck is fantastic. We ate every meal out there, used the barbeque, and felt very at home in this perfect little tree house getaway. Super close to Leavenworth along a beautiful drive! So cute and perfect! This rental was fantastic for a weekend away for my husband and I. We will definitely be back! 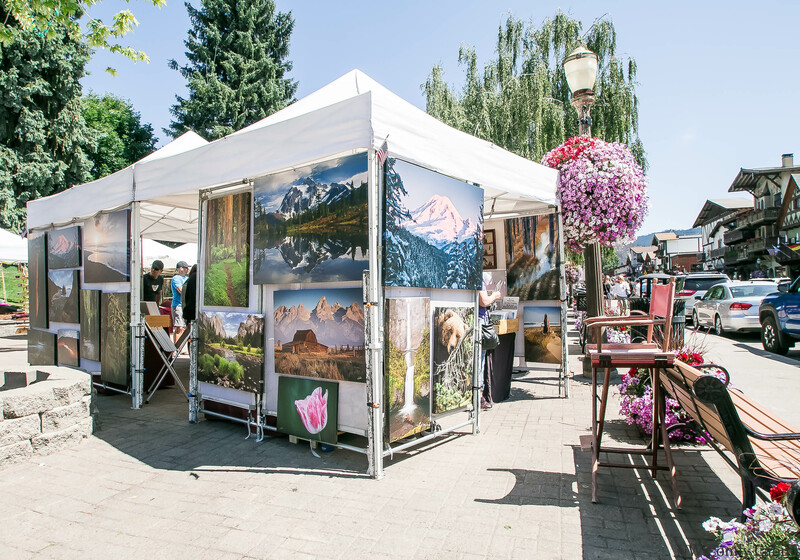 We had never been to the area and decided that although Leavenworth is a nice tourist town, we will spend all of our time enjoying the beauty in the mountains. The view was spectacular! Comfy cabins made the process super easy! Very nice cabin with a fantastic view and just the right distance to Leavenworth. Easy to get there but away from the crowds and heat. There are neighbors nearby but they are quiet and kind. Don’t miss the great coffee at the hardware store down the road. My husband and I spent five nights at this cute little cabin. The view is spectacular. The kitchen had all the essentials. The bed was comfortable. We enjoyed the hot tub, although the circuit needed reset frequently to keep it on. Manager response on 2019-02-04 - Response from NW Comfy Cabins Inc. Thank you Rhonda, for your comments. We are pleased that you enjoyed the Das Tree Haus. The neighbors are set below the cabin and not very noticable, which I think really add to the more private feel for sure. We love the Plain Hardware coffee. That tiny little town packs a punch with the Hardware Store (such awesome gifts and more) Winery, Grocery and Old Mill Cafe as well as Mountain Springs Lodge. It is a great spot and we are very proud of our little town. We hope to have you back and to make use of the return guest discount. The cabin was very charming and had all of the comforts of home. It was exactly what we were looking for and was just like being in a treehouse. Once stepping out on to the wrap around deck all you can do is take a deep breath, take in the view and sit back in awe. The driving directions were very easy to follow and even though there were houses close by, we never noticed that we weren't alone. We will definitely be back! So glad you enjoyed this quaint home, and we welcome you back any time and hope that you will use your return guest discount to do so. Thank you so much for being our guests. This cabin is excellent for a weekend getaway for 2. Manager response on 2015-10-22 - Response from NW Comfy Cabins Inc. The cabin was perfect size wise for myself and my wife, and our two dogs. I really enjoyed sitting on the porch and enjoying that view! Will defenently be staying here again at some point. Manager response on 2015-11-17 - Response from NW Comfy Cabins Inc.
My boyfriend and I stayed here for our 10th anniversary. We were planning on visiting Leavenworth while we were there but the cabin was so nice we never left. It was secluded yet close enough to run to Plain for last minute grilling needs. The cabin was cute and clean. The deck was spacious with an incredible view. And the hot tub provided a warm way to enjoy the sunsets during the chilly October nights. I even had my tea in it in the morning. :) All in all, it was exactly what we wanted for a relaxing anniversary. Manager response on 2015-11-10 - Response from NW Comfy Cabins Inc. Manager response on 2015-11-11 - Response from NW Comfy Cabins Inc.
All around an amazing weekend! Manager response on 2015-12-12 - Response from NW Comfy Cabins Inc. Manager response on 2015-12-29 - Response from NW Comfy Cabins Inc. Arrived late on a Friday night and nearly drove right past the cabin, GPS said we had another .2 miles. Door code provided through NWCC App and website were incorrect, double check with them before you get there lucky for us we got a cell number from the office voicemail to text. Cabin was amazing, everything the pictures showed. It is snug, but in the winter months it made for a great cozy weekend. 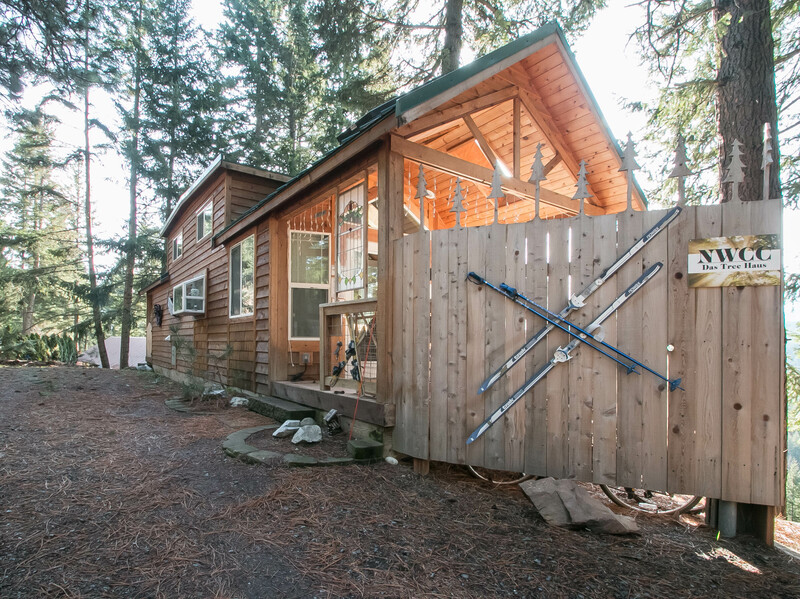 Overall the property is mixed in with other cabins so it is not as remote as you might think. The deck was awesome when the sun came out, took our snacks and drinks and sat outside to enjoy the amazing view. Hot tub was great, although a little overfilled, when you put two adults in we probably lost a couple gallons of water over the edge. The town of Plain is just 2 miles back up the road in case you need to visit the small store. All in all a great weekend and we will most definitely be back! Last minute booking turned into best decision of our trip! We booked Das Tree Haus the day we were heading over from the west side, not only was it last minute, but it was a sunday, so I was nervous if anything went wrong, no one would be in the office. Luckily everything thing went PERFECT! Beautiful place, just as described plus an AWESOME collection of Disney VHS movies, which was perfect for after the hot tub! My only advice to future guests; if arriving at night, it's a little tricky to find/see, our GPS was incorrect, but close enough to where we found it on the 4th time down the same road :) dont worry, it's there, and it's wonderful! Thank you so much for the opportunity to share your lovely abode! ? Manager response on 2016-02-24 - Response from NW Comfy Cabins Inc.
A very enjoyable time away from the city. A wonderful view. Very clean with modern appliances. The cabin was very nice other than there being little to no space in the closet and drawers because they were filled with extra sheets, cleaning supplies and random stuff. My major issue was being given the wrong code to get into the cabin. I arrived at 4 pm which was when we were supposed to check in. My door code was wrong. I called and texted for 3 hours but no one contacted me. Finally we crawled in through a window and that wasn't locked. Finally at 8 pm Comfy Cabins contacted me with the correct door code. Very unacceptable! They should have at least offered me a late checkout. Otherwise the cabin was quite nice and the view was beautiful. They really need to work on their customer support. If there is no one around to answer a phone at 4 pm on a Thursday, something is wrong! Manager response on 2016-05-14 - Response from NW Comfy Cabins Inc.
My husband and I spent two wonderful nights here. The place was clean and quiet, and the hot tub was wonderful after a long day of physical activity. The place was a little difficult to find; fortunately, we spotted the sign out front. This property is beautiful and clean and everything you'd want for a getaway. There were a couple of issues like NO EATING UTENSILS and the hot tub was wonderful the first day of our stay, but the following days the jets did not work and the temperature was cold. After coming back to the city (when I got wifi) I addressed the issues with NW Comfy Cabins and never heard a response. It has been two days. Ultimately a great option for some solace but don't expect any help from the renters if anything goes wrong. Overall we had a good time. I surprised my boyfriend with a trip for his birthday. Honestly, we got lost on the way, following the directions provided. They're horribly written directions. The hot tub didn't seem to be ON, although it was still warm. And despite all of the signs there actually weren't any instructions specific to that hot tub. The fire pit was out of propane, or the top was screwed on too tight, we would've needed tools to loosen it. And what a horribly uncomfortable bed. I actually couldn't wait to get back home to sleep in my own bed. My boyfriend's sentiments were the same since we both left with bad neckaches and backaches. 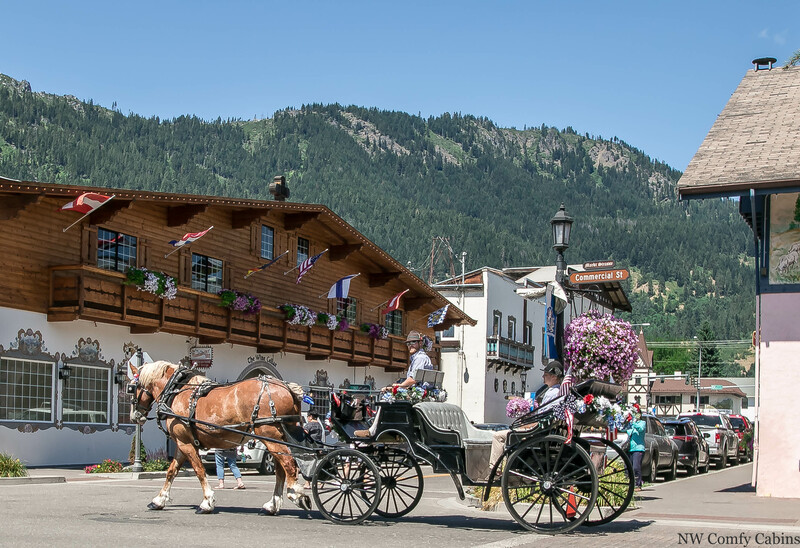 Also, the location was at least 20 minutes away from the town of Leavenworth, which would've been good to know when I made that reservation. Manager response on 2016-07-27 - Response from NW Comfy Cabins Inc. The property was wonderfully cozy! Great amenities, aside the bedding. As noted by other reviewers, the bedding wasn't very comfortable. My only other complaint is what I consider gauging for pet rent. I realize a lot of renters do it but I feel really taken advantage of when people charge per night for pets. Thank you for your feedback, I understand where you are coming from. I am glad you found yourself cozy and enjoyed your stay. Danny! My wife and I need a relaxing break and this fit the bill. Beautiful view over the valley and of the Wenatchee River. Loved the large deck! We ate just about all our meals out there. We were sad to leave, but returned home relaxed and rejuvenated. We spent two nights at Das Tree Haus. First the postives: the deck is large and has a wonderful view. However, the cabin itself is quite cramped, the hot tub is tiny and luke warm, and the location is not as private as the pictures would lead you to believe. The blinds in the bedroom were falling apart, and the quality of furniture in the cabin is not high. The bed was not comfortable and there is no great space really for relaxing. For the price, I was expecting something of a little higher quality. We probably would not stay here again. Manager response on 2016-10-18 - Response from NW Comfy Cabins Inc. Enjoyed my stay at this adorable cozy cabin! The view was absolutely beautiful! My significant other and I spent every meal out there on the deck. The cabin was the perfect gateway for a couple of days. The owner was extremely nice the day before our reservation they allowed us to bring our dog at the last minute, which I was very grateful for! I received emails from them upon my stay, just checking in making sure everything was going good. However I didn’t read them until I left, I wanted no contact from the outside world and the cabin fulfilled it. I will definitely be coming back and telling everyone about my experience. I would recommend this to people I don't hate. Everything went just as it should have and my wife and I had an amazing time. I would totally do this again and would recommend to a friend. Manager response on 2017-01-04 - Response from NW Comfy Cabins Inc.
Great little cabin in a nice community. 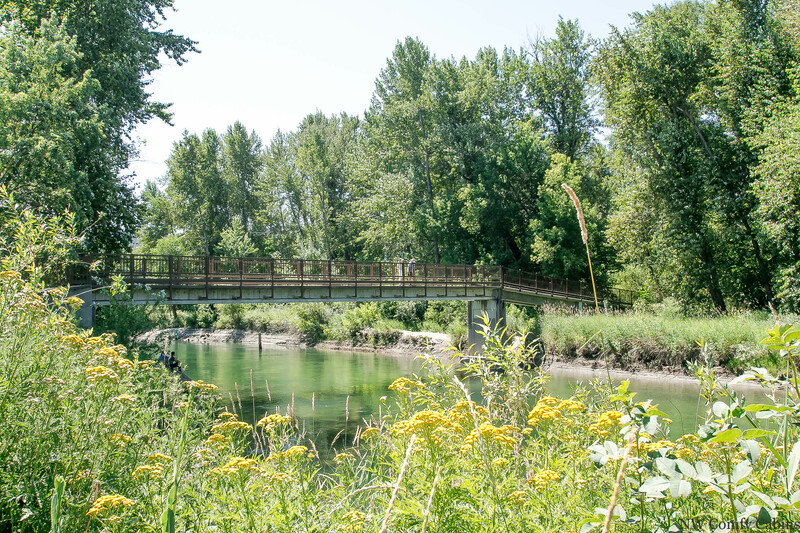 There are several trails to explore nearby. The cabin was clean and nicely decorated. Recommend updating the bedding with better quality sheets and comforter. Spectacular views. Manager response on 2016-11-08 - Response from NW Comfy Cabins Inc.
We came to go to Leavenworth for the Christmas Lights. This little cabin was probably the highlight of our trip. The view was beautiful, the hot tub was perfect and the atmosphere was just what we needed. Well, it was terrible to try and find at night. The GPS coordinates (latitude and longitude) are incorrect and take you down the First Camp 12 Road, and if not, you get taken all the way down the other road towards different rentals. Outside of that, the hot tub had some grime in it that I had to clean, and the propane grill was not all that great, as it couldn't even cook chicken all the way through. I also think it'd be great if the deck was cleared of snow between rentals. The view from the cabin is amazing and the hot tub extremely comfortable and relaxing. This cabin is definitely worth another visit. Cozy comfortable cabin with nice views. Das Tree Haus was a clean and cozy cabin perfect for two people. The wrap around deck gets lots of late afternoon sun and is a great place to relax and take in the river views while eating dinner. The kitchen is well equipped, and the house had pretty much everything we needed. Very convenient to be able to do a load of laundry before leaving. No problem recommending a stay here. Manager response on 2017-09-08 - Response from NW Comfy Cabins Inc.
Miiles, we are so pleased that your stay was comfortable and enjoyable. We would love to have you back, you were a fantastic guest. Thank you for staying with NW Comfy Cabins. Very cozy and clean! We loved the quaint little town of Plain. Leavenworth was within good distance distance. We really enjoyed the cabin! Thankyou! We even received a few little gifts for our honeymoon courtesy NW Comfy Cabins! Thank you! Manager response on 2017-07-25 - Response from NW Comfy Cabins Inc. Manager response on 2017-04-11 - Response from NW Comfy Cabins Inc.
We had a perfect visit. The view while sitting by the fire pit was lovely. I loved waking up and having a coffee on the deck, and listening to the birds and the river. Loved our time here and look forward to booking again! Tiny house with a view! The view and setting for this rental is amazing. It had everything we needed to be comfortable and cozy. The one thing I would replace would be the mattress as its actually really uncomfortable and noisey with every move. Manager response on 2017-09-22 - Response from NW Comfy Cabins Inc.
Great experience! The place was very cozy & romantic. We got engaged on the back porch. We did bring our dog, & the gate latches were hard to use. How special!!! We are so honored to be apart of such a special moment. See you for your honeymoon ;) Danny! We enjoyed a lovely mid-week stay and found the cabin to suit our needs perfectly. We hiked in the area during the days and came back to thorough relax in the evenings. The fenced deck was perfect for us and our dog. We spent peaceful times gazing at the river view and the stars at night. The cabin is very well-appointed and clean. We agree with other reviews that note the bed is not entirely comfortable, though. Otherwise everything was just right! Manager response on 2017-09-03 - Response from NW Comfy Cabins Inc. Very cozy, beautiful and secluded. Perfect location for wanting to get away, but having the option to go into Leavenworth or Wenatchee as well. Very small, but very cozy. Great deck with an awesome view. It was a cold weekend when we went and the cabin does not have a good heat source. We showed up and I think it was colder in the cabin then outside. It took sometime to heat it with the little portable heaters they had. It is very small and you would not want to be there with any more then 2 people, not even a pet!! One of the pictures made me think you had a fire pit down over looking the river but that was the neighbors place. It was a very nice view and we really did enjoy the time we had. Very cozy and clean place. We had a very relaxing time at this cozy cabin. The views of the river were amazing!! The hot tub is perfect just for two! We were so impressed. From the moment we opened the doors we were pleasantly surprised. The cabin was immaculately clean, decorated nicely and the space was well used. When I opened the back bathroom door and stepped onto the patio I was blown away. It was so gorgeous ! the river right below and the mountains in the background. I loved how large the deck was. The hot tub was perfect and clean and we used it everyday. The bed was comfortable as well. While the view was breathtaking and the cabin quite cozy and charming,... The bed was terrible! The mattress is in desperate need of replacing. Mattress is very soft and uncomfortable, thus contributing to a restless, miserable night of sleep. Also, there were over 20 flies inside the house that I had to kill (without a flyswatter). Those two complaints could be easily fixed and I trust the owners will do so soon, because outside of those two issues, I would most definetly recommend this cabin and would consider staying there myself. My wife and I came on our honeymoon a couple weeks ago. We decided to have a little city time in Seattle and a good chunk of it in the cabin. This place is beautiful and, honestly, just like home. The house we now live in is just shy of 600 sq ft, so Das Tree Haus was not far off. We had beautiful mornings on the balcony while eating out breakfast and fun times hiking down to the river. With a local store about 5 minutes away in Plain, you can pick up everything you need to have a relaxing getaway just to yourselves. 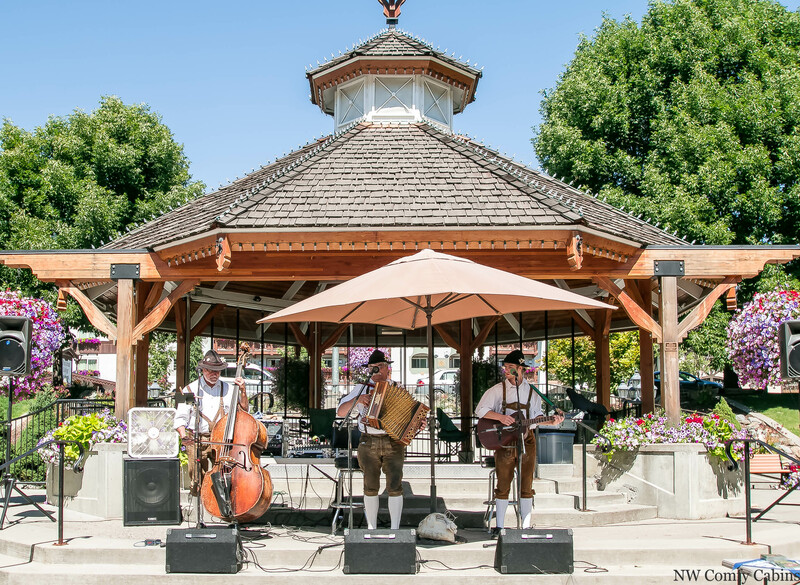 It also doesn't hurt to be a few miles away from Leavenworth where you can experience rich Bavarian culture with local craft brews and wines. Overall spectacular time and we will most likely be making this, or anywhere in Washington really, our go to getaway. We rented this cabin because it was close to a family reunion in the area. We basically just used it to sleep and didn't really spend too much time in it. However, we did use the hot tub each night and the view from the deck spectacular. The only negative was that the main door didn't lock from the inside. Not a big deal for most people, but we have a two year old who was able to get outside because we couldn't lock the door. My husband and I enjoyed 2 nights at Das tree Haus. We went on walks, ate our meals on the deck and loved the hot tub. This was the perfect spot for a short 2-night honeymoon after our wedding. 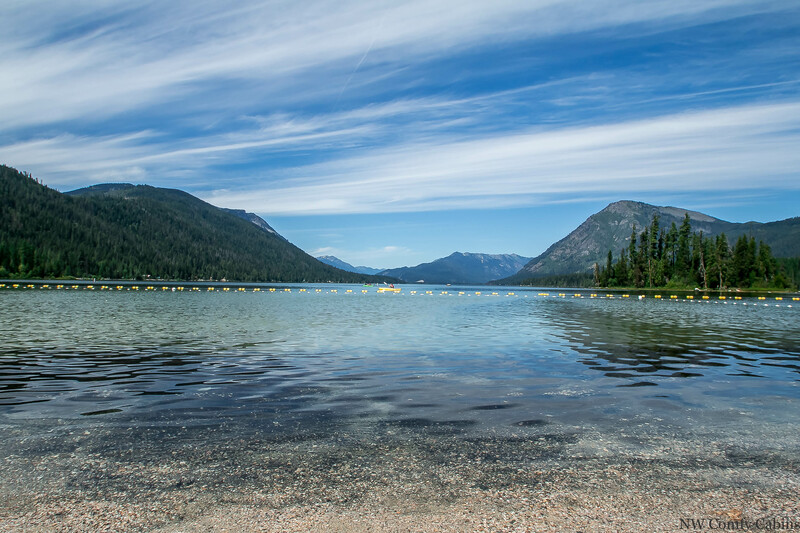 Location is great, not too far from Leavenworth and very close to Lake Wenatchee. 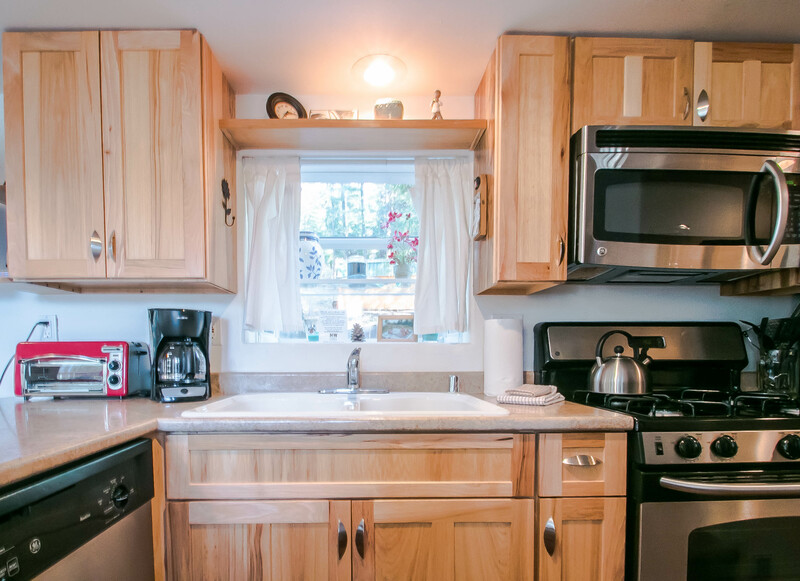 The cabin itself is very comfortable with all the essentials, and the deck with hottub made for dinners with beautiful views and relaxing evenings. Would definitely come back! The cabin is small, but has almost everything you could want. It was very clean and easy to find. We truly enjoyed the view and our stay in Leavenworth overall! The only criticism I can give is that the bed is completely worn out and in serious need of replacing, we both woke up with backaches. Also, attention ladies there is no blow dryer... But we look forward to another stay again soon, hopefully on a new bed! We enjoyed our stay hear at the Das Tree Haus! Cute little cabin in the woods with super views of mountains and the river. The deck was so great to eat and hang out on, the hot tub was nice too. Very enjoyable stay. We would love to come back again to enjoy other seasons. The pictures and description were perfect. It met all of our expectations. We would highly recommend this facility. A little information about the emergency siren would be helpful. Property was in good condition. BBQ grill on last leg. Privacy is nil, there are cabins all around. Would like to have had privacy curtains around hot tub. View of river was awesome. No public access to near-by lakes without paying for it. Wanted to fish but couldn't. Local town has hardware and small grocery store, spendy. Restaurant rarely open. 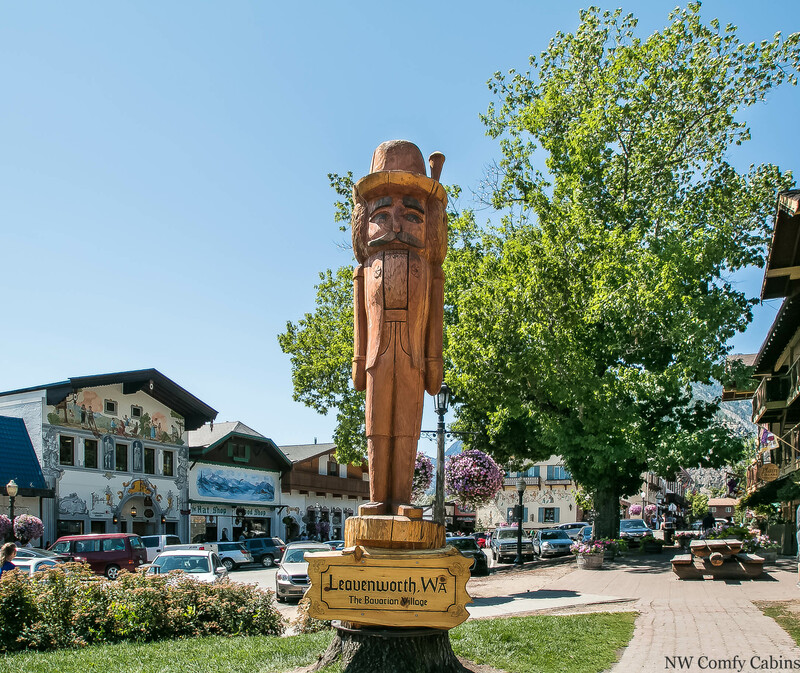 If you want to eat out you need to go to Leavenworth. Bring your own DVD's, none there. DVD player is built in TV and does not play blue ray. No cable/satellite or internet. Enjoyed stay, but six days is too long. 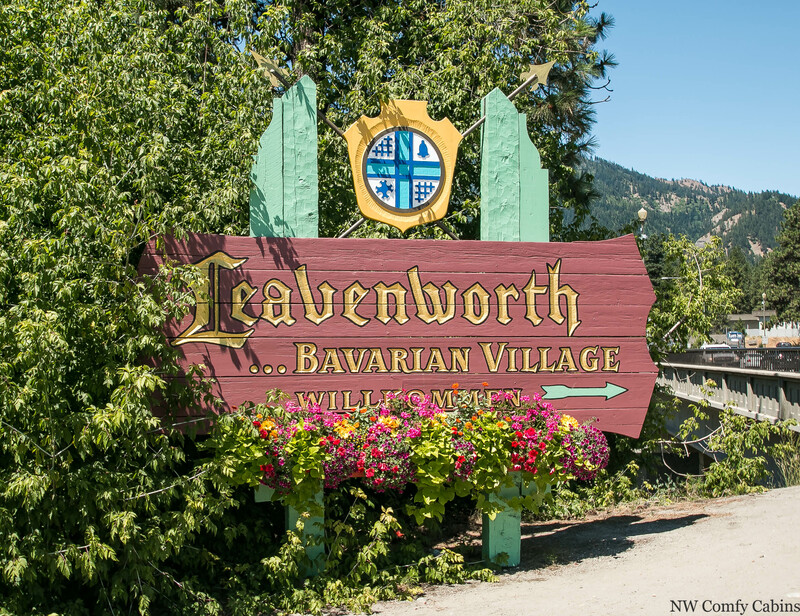 Found it easier to get to cabin (using I-90 route) by going through Leavenworth on Hwy 2 then following directions as if coming from Seattle on Hwy 2. Chumstick Hwy is very curvy especially just before Plain. It's a little longer going through Leavenworth, but the road is much better. Manager response on 2014-09-20 - Response from NW Comfy Cabins Inc. Thank you for your review, we will most definitely send your review over to the owner of the Das Tree Haus, and appreciate your suggestions. Thank you for staying with us. My wife and I had a great time at Das Tree Haus in Plain,wa. Everything was made so easy from Comfy Cabins. From directions and calls to tell us about icy roads. We had a worry free and relaxing stay! We had the perfect time for two. Lovely and quiet. The view and the hot tub were delightful. The only issue we had was that the bed was too soft for our taste. Manager response on 2014-11-11 - Response from NW Comfy Cabins Inc.
We had a nice stay. It's a cute little cabin and good for a small family or couple. We had a very nice couple of days. The cabin was clean, had all the necessities we needed and the hot tub was perfect. Exactly what we had hoped for. It was a bit tricky to climb under the kitchen table to get the heat just right, but that shouldn't detract from the fact that everything worked and was nice and tidy/clean. This was a gorgeous cabin. My boyfriend and I really needed a quiet getaway for a few nights and this was the perfect spot. There was a cute little loft up in the cabin where we sat and watched Disney movies. We cooked delicious meals every night because there is a full kitchen. The only con was you are fairly close to other cabins and it is more of a residential area in the woods. So if you are looking to be out in the sticks I wouldn't recommend this place. Overall we had a great trip and I would definitely recommend this place to my friends and family as well. My fiancé and I came up to the cabin for a few nights and loved our stay. The view of the river and mountains was wonderful, and the coziness of the cabin made the trip. Days tree haus is amazing! Wish I could give 6 stars to everything. Manager response on 2015-03-13 - Response from NW Comfy Cabins Inc. If you want a nice quiet getaway, with one of the most breathtaking scenic views ever, then Das Tree Haus is what you are looking for. The apparently inoperable furnace was the only downside, but with a little patience, the provided radiant heaters kept the place warm for the weekend (not an issue in warmer months). We are already looking forward to our next vacation at Das Tree Haus. 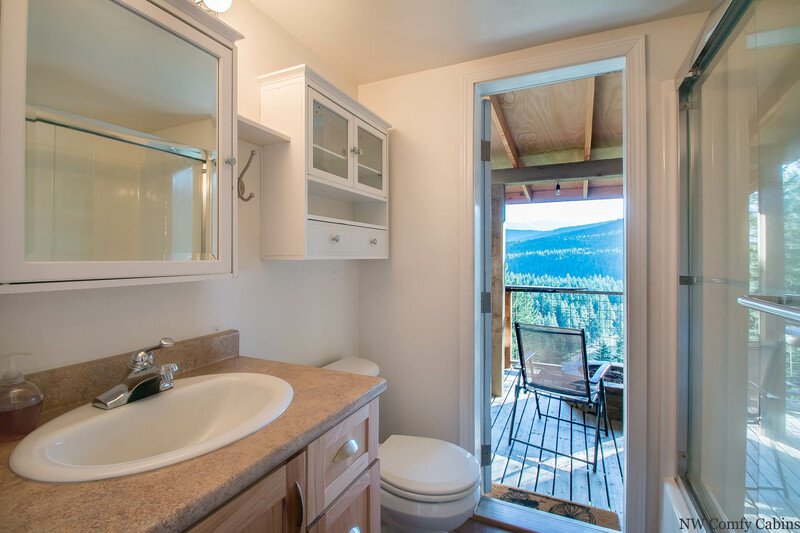 Manager response on 2015-04-28 - Response from NW Comfy Cabins Inc.
Not quite what was expected; the view was very nice, of the river and mountains, but the bed was saggy, and the hot tub had some privacy issues, ( like couldn't use till dark because of neighbors). Cabin was small, and very narrow in places. But it was clean and well maintained. The cabin was everything we were looking plus more!! Beyond amazing! Couldn't have asked for a better view. It was the perfect getaway for two. My boyfriend and I came to Das Tree Haus to decompress from a stressful school year, and to celebrate his college graduation from PLU. We could not have asked for a better way to relax, and kick off our summer vacation. The location of Das Tree Haus was absolutely beautiful, and the cabin was very neat, clean, and welcoming; we did not want to leave. We left the cabin feeling very refreshed, and will be back in the future! Manager response on 2015-06-08 - Response from NW Comfy Cabins Inc. While the house was a little smaller than it appeared in photos, it was clean and just right for 2 people. I was also hoping for a little more privacy but because of the time we went in May there were not many other cabins occupied, except in the house above. Although they used some power tools while we were there it was not all day and easy to ignore. The view from the deck was great. Watched the birds swooping all day and then bats in the evening. 1) Refrigerator was very loud, the fan ran all day and night. Closing the bedroom door easily muffled the sound. 2) The bed was super soft, roll to the middle soft. 3) The sheets were very old, so old they had lint pills on them. Although we saw new sheets in the cupboard?? 4) There are mirrors on the outside of the house?? There was a robin that was having a time of flying into the mirrors waking us up at sunrise. I had to use earplugs to not be bothered. This is probably a seasonal thing, but what are the mirrors for? 5) Hot tub did not get very hot. NW Comfy Cabins was a great find. They answered questions immediately, even at 10:30pm when I asked if we could check in a few hours early. All in all a successful getaway weekend for hubby and me. Manager response on 2015-05-18 - Response from NW Comfy Cabins Inc.
Monica, Thank you for taking the time to tell us about your stay at the Das Tree Haus. We are glad you enjoyed your stay overall. 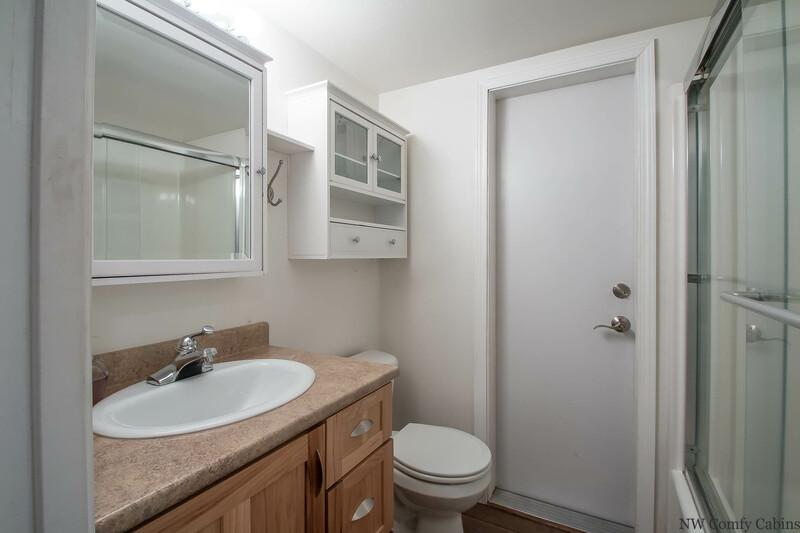 We will notify the owners of the property about the concerns you told us about and honestly we are unsure as to why the mirrors are there. They were on the home before we took the property on as managers. We will notify the housekeeping also to change out the older sheets with the new ones. We do hope you will come and visit us again in the future. Your NW Comfy Cabins Rental Crew. It was awesome. Great view, great area, great cabin at a great price. Would stay again! Manager response on 2015-08-10 - Response from NW Comfy Cabins Inc. Manager response on 2015-09-19 - Response from NW Comfy Cabins Inc. I had a great time! It was super relaxing and quiet and the scenery was beautiful. I would definitely go back and stay in the same cabin. The cabin was lovely! Very clean, comfortable, great view! Had most things you would need for cooking and such. No can opener (not the end of the world, we just happened to need one, haha). It was also very hot out so we had to be good about venting VERY well in the evening when it cooled off since there was no A/C that we knew of. It's hard to write about all the other good stuff! Deck was perfect for BBQ'ing and breakfast. 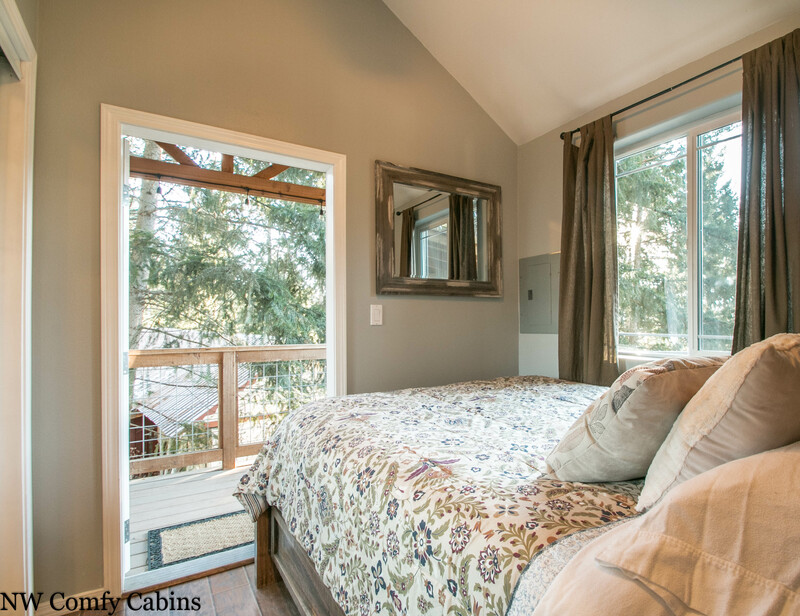 Manager response on 2015-08-13 - Response from NW Comfy Cabins Inc.
What a fantastic, beautiful place to stay! It was like a home away from home when it came to comfort; the cabin was cozy and we had everything we needed for meals, entertainment and relaxing. The view off the deck is breathtakingly beautiful and it was such a treat sitting by the fire pit at night and watching the night come down on the trees and mountains. We'd done some hiking each day, and the hot tub was just the ticket for soothing sore muscles at the end of the day. With the tub jets off, we could enjoy the songs of the little crickets and frogs off in the darkness. A privacy screen on the porch would have been nice, though. Overall, the cabin is an oasis of peace and beauty, making it hard to say goodbye on the last day. We will definitely come back again in the future! Manager response on 2015-05-26 - Response from NW Comfy Cabins Inc.
We had a wonderful time at this cabin & would enjoy returning someday! Highlights included the gorgeous view, spacious deck, private setting, & hot tub. Manager response on 2015-07-31 - Response from NW Comfy Cabins Inc.
My husband and I loved spending a long weekend at Das Tree Haus. It was the first time in a long time that I was able to truly relax--the beautiful view, huge deck, hot tub, and the quiet made it so easy. We were so glad to be able to bring our small dog with us too; he loved sunbathing on the deck. We appreciated the through driving directions and general instructions, which helped us have a smooth stay. The cabin was all that we expected. Everything was clean, cozy and quiet. The views of the river valley and surrounding hills are awesome. Watching shooting stars from the hot tub was spectacular. We had a GREAT get away. Manager response on 2015-10-16 - Response from NW Comfy Cabins Inc.